happened much earlier than anyone thought. The largest fishes in the oceans feed on some of the sea’s smallest organisms. Several massive plankton-feeding elasmobranchs – the group of fishes that include sharks and rays – evolved adaptations to gulp huge mouthfuls of water and filter out plankton, shrimp, and small fishes. Though these tiny tidbits in themselves may not seem like a meal fit for a giant, the sheer abundance of these minuscule organisms in the sea adds up to a bounty for animals designed for sifting and straining them out of the water. What’s even more interesting is that each of the four massive filter-feeders evolved their particular diet and feeding morphology independently of one another. Today’s giant filter feeding elasmobranchs. 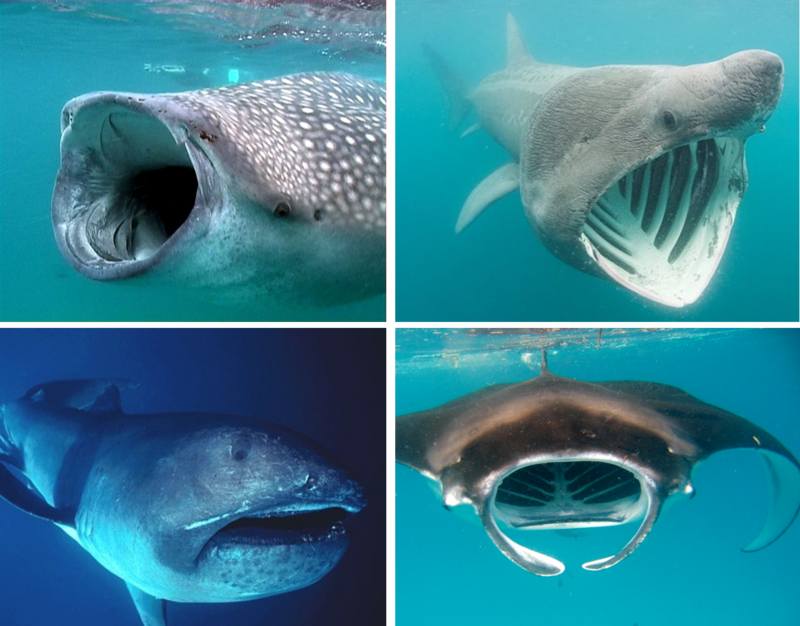 From top left Whale Shark (Rhincodon typus), photo by Werner Mischler; Basking Shark (Cetorhinus maximus) , Doug Perrine; Reef Manta (Manta alfredi) Kristy Cole, Underwater Escapades; Megamouth Shark (Megachasma pelagios), Wikimedia Commons. Whale Sharks share a common ancestor with the docile nurse sharks, basking sharks are part of the branch of the shark family tree that has great white and mako sharks, the megamouth shark may be descended from the Odontaspidids, which includes the sandtiger sharks, and the manta rays are related to the much smaller bat rays and eagle rays. This is called convergent evolution, where natural selection steers the similar re-engineering of preexisting anatomical traits to achieve a similar solution between different groups of unrelated organisms. In the evolution of elasmobranchs over the last 45 million years, three lineages of sharks and one lineage of rays all independently evolved to filter-feed feed on plankton, swarms of tiny shrimp, and schools of small fishes as a means to successfully increase their survival. Farther back in time, during the Cretaceous period when dinosaurs roamed the land and huge marine reptiles swam the warm, shallow continental seas around the globe, this same experiment in filter-feeding evolved much earlier, and completely independently of any of today’s huge plankton-eating sharks. In a recent paper in the Journal of Vertebrate Paleontology, Kenshu Shimada and an international team of researchers unraveled the complex and confusing identity of several species of fossil shark teeth and found them to be the earliest known example of filter feeding in sharks. Small teeth from ancient marine rocks in Colorado, Texas, and Russia showed certain characteristics seen in recent giant filter-feeding sharks. In fact, the teeth looked so much like the huge deep sea filter-feeding Megamouth shark Megachasma, that the new genus was dubbed Pseudomegachasma. Pseudomegachasma comanchensis from the Late Cretaceous of Colorado. Photo by K. Shimada. and strangely, increased in numbers rather than disappeared altogether, so filter-feeding sharks and rays have hundreds of itty-bitty seemingly useless teeth in their jaws. Fortunately, all sharks and rays shed their old teeth to make room for the new ones growing in, which is how such teeth from ancient sharks later become today’s fossils that guide our understanding of shark evolution. These teeth from at least two different species make Pseudomegachasma the oldest plankton-feeding sharks yet known, and is believed to have evolved from an earlier, extinct fish-eating shark. Pseudomegachasma lived between 92-99 million years ago, first appearing in coastal waters that is now southwestern Russia, and later extending into the ancient inter-continental marine seaway that once covered an area from Texas to Colorado. Why Pseudomegachasma went extinct, and why there seem to be no giant plankton-feeding sharks between 50 and 91 million years ago is still a mystery that only future fossil discoveries can solve. The separate evolutionary histories of today’s giant planton-feeding elasmobranchs, and the previous evolution and extinction of the first filter-feeding shark Pseudomegachasma. The research team consisted of Kenshu Shimada, DePaul University; Evgeny V. Popov, Saratov State University, Russia; Mikael Siversson, Western Australia Museum, Bruce J. Welton, New Mexico Museum of Natural History, and Douglas J. Long, California Academy of Sciences and St. Mary’s College of California. Shimada, K., E. V. Popov, M. Siversson, B. J. Welton, and D. J. Long. 2015. A new clade of putative plankton-feeding sharks from the Upper Cretaceous of Russia and the United States. Journal of Vertebrate Paleontology, Vol. 35, No. 5. Share the post "Before Giant Plankton-Feeding Sharks, there were Giant Plankton-Feeding Sharks."